We Didn't Always Have Sunscreen. My mom grew up in the California desert before sunscreen was even invented. Sadly, you could tell from her skin. And as a kid I only remember wearing sunscreen ONLY when we went to the pool. My neighbors used to go to a tanning booth before any sunny vacation to get a base tan. Everyone thought it was better for your skin than burning on the beach! For years I thought the SPF makeup I wore protected my skin from the sun. Then when I was about 24, my friend, Kristin, started working for Clinique. She was the one who told me I needed to wear sunscreen under my makeup – and I thank her to this day! – and my kids may never need skin rejuvenation. Sunscreen is widely considered to be the best anti-aging product. That’s because sun is the biggest cause of skin aging. Most things we don’t like about our skin can be attributed to sun exposure – dark spots, lines, wrinkles and skin cancer. That’s why every person (over the age of 6 months) should wear sunscreen daily. Daily sunscreen use, all year long, is the key to beautiful, healthy skin. 1. No sunscreen will be effective longer than two hours without reapplication. 2. Skin redness is a reaction to UVB (burning) rays alone and tells little about what UVA (aging) damage you may be getting. Plenty of damage can occur before you see sunburn. UVA radiation, penetrates deeper into the skin than UVB rays, causing premature wrinkling, age spots and a heightened risk for some skin cancers. 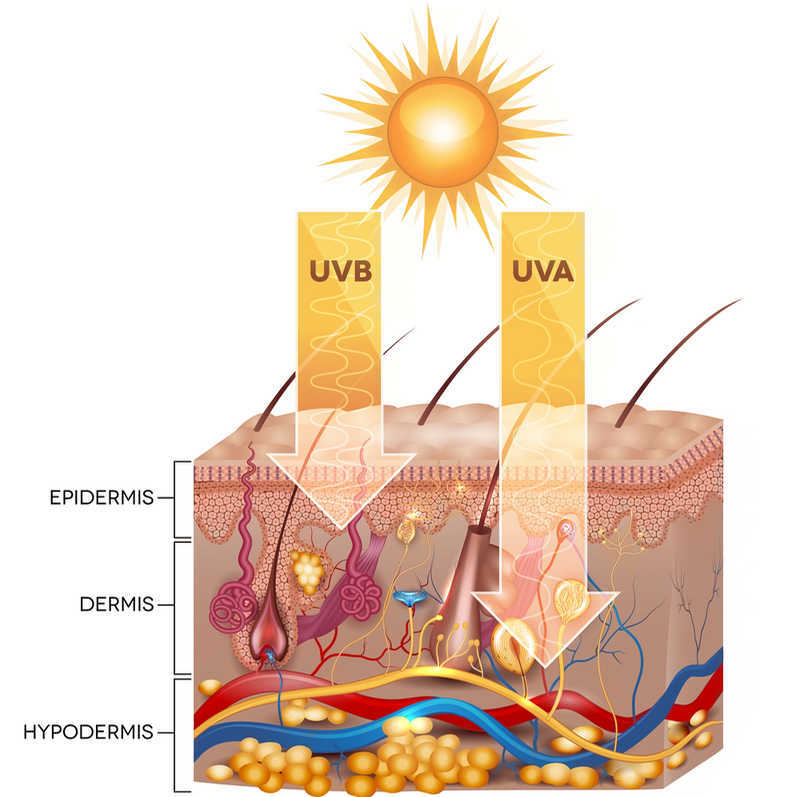 Sunscreens that are labeled broad-spectrum block both UVA and UVB rays, but there is no standard for listing UVA blocking power. Mineral / physical sunscreens (with the ingredients titanium dioxide and zinc oxide) that deflect sunlight are the only sunscreens that will protect from both UVA and UVB rays. Additionally, as the numbers go up from SPF 15, the protection from UVB rays increases only slightly. OK. So what's the best sunscreen? “Look for SPF 30, which will block 97% UV rays but also look for zinc oxide in greater than 3% to provide coverage of UVA light and better overall protection. Why isn't the sunscreen in my makeup enough? Even if your makeup has SPF in it, you still need to wear an additional layer of sunscreen. The concentrations of sunscreen in makeup are too low to protect your skin properly. Put it this way. To get really good coverage, you would need to apply so much makeup that you wouldn’t feel comfortable leaving the house. Not pretty! Apply sunscreen daily just before applying makeup. And remember, staying out of the sun is still your best bet for beautiful skin. But I have to mow my lawn - and I want to go to the beach! Experts recommend using a water-resistant sunscreen applied liberally (about 1 ounce for your body) half hour before going outdoors. It should be reapplied at least every two hours or after swimming, drying off, or sweating. You should not rely on sunscreen alone to protect your skin from the sun. By following the Prevention Guidelines outlined by the Skin Cancer Foundation, you can lower your risk of developing skin cancer while keeping your skin younger looking. Apply 1 ounce (2 tablespoons) of sunscreen to your entire body 30 minutes before going outside. Reapply every two hours or immediately after swimming or excessive sweating. Mineral based sunscreens need to be shaken before they are applied. See your doctor every year for a skin exam. The SkinCeuticals cosmeceutical line offers broad spectrum, mineral based sunscreens that offer more UVA protection than most sunscreens. They also make anti-oxidants with Vitamins C and E and Retinol which can help correct sun damage. Unsure what cosmeceuticals are? Read our blog posts, Advantages of Cosmeceutical Skin Care Products and Physical Sunscreen vs. Chemical - What's the Difference?